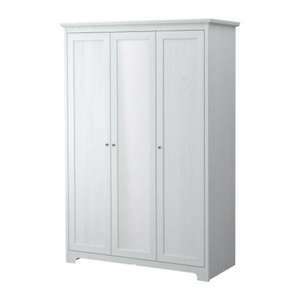 Wardrobe with 3 doors in white is down in price. From £140 to £100. This can only be purchased in store unfortunately, but stock levels seem good. The vouchers doing the rounds sadly do not work with this, I tried. Be warned, don't send the missus to collect, each box is 40kg. Oh, thank you for that - made my day! We have this in one of our rooms, quiet a bit of storage and comes with all the required shelves ! steal at £100 ! Bought one of these for the nursery a few months back (albeit with a mirrored door). Pretty good wardrobe, loads of space and hoping it'll last for years when the little one grows up! Bought one of these for the nursery a few months back (albeit with a … Bought one of these for the nursery a few months back (albeit with a mirrored door). Pretty good wardrobe, loads of space and hoping it'll last for years when the little one grows up! If you move it alot it won't. I agree with Speedski, I have some great products from Ikea that have lasted years and should last just for quite sometime. Some products can be flimsy, but overall they'll last ages if looked after. If you're a cheapo and want to save 20 quid for around the same type of wardrobe + side cupboard, get a Dombas. It's 80 quid at Ikea instore too. Got it last week. This looks nicer though. Heat added. Would anyone know the box dimensions? The site's figures do not look logical. I assume 56cm x 200cm but it sounds like there could be multiples boxes too. Hoping to fit through car on front seat. I bought 2 of these a few weeks ago (at full price) picked them up in a toyotal avensis saloon. Two boxes for each wardrobe one is longer than the other but struggled to get two in the car - had to tie the boot lid down as it wouldn't shut. I live about 2-3 miles from an Ikea though so didn't have to travel far. Need one of these been planning to get to Ikea to get one so good timing. When you see these in store they are actually horrible looking IMO. They are extremely lightweight and not too tall making them perfect for the loft conversion rooms i have put them in. Two boxes, just under 6ft in length, front passenger squashed against windscreen and kids pressed down into seats, half hour of hell driving home...happy days! Two boxes, just under 6ft in length, front passenger squashed against … Two boxes, just under 6ft in length, front passenger squashed against windscreen and kids pressed down into seats, half hour of hell driving home...happy days! Great deal got wardrobes and some bedside tables and even used the vouchers on separate transactions to save a further £15 off the total combined bill. Heat! Managed to grab the last one in Tottenham! Cant complain for 90 bugs! Assembled on Friday night, boy this was a beast to put up alone in a box room!